Sometimes I'm reminded how lucky I am to be friends with some brilliant museum professionals in New York City. Last week, Sarah Litvin, an educator at the Lower East Side Tenement Museum, gave me a private, behind-the-scenes overview of the museum's new Shop Life tour on which she had worked diligently for the past few years. 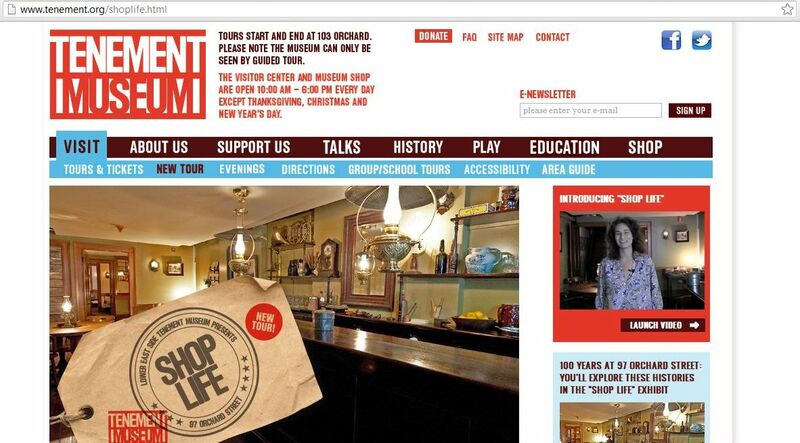 To create Shop Life, the TM staff reconstructed the saloon owned by the German immigrant Schneider family in half of the basement level of the museum's historic tenement building located at 97 Orchard Street. The Schneider family had occupied the space during the 1870s, housing their saloon and a meeting room for social clubs in the front section of the apartment and housing their kitchen and living quarters in the back. The entire space is about the size of a decent 1-bedroom New York City apartment today. Like all of the TM apartments, the Schneider saloon was meticulously researched, populated by representative artifacts acquired at antique shops and built using mostly authentic building materials. Sarah told me about how the museum had worked with a professional "food fabricator" to construct delicious-looking fare including sauer kraut, sausages, and seasonal lebkuchen (a German Christmas Cookie). Caroline Schneider would have served lunch to her customers for free. (Even in the 1870s, it was the liquor that paid for the restaurant). In addition to offering the TM's traditional immersive experience of the built environment, Shop Life incorporates artifacts in unique ways to tell the story of the evolution of the space over time. The rear end of the southern basement apartment was left close to how it appeared before the renovation/reconstruction, showing exposed brick and wood and an open tiled fireplace. In the middle of the room, an artifact case houses objects excavated from the building's back privies and fireplaces. Emblematic of saloon life, these artifacts include a piece of a ceramic bier stein and a page from an 1870s German-language newspaper. In the front half of the southern basement apartment, the TM has undertaken a mostly successful experiment with interactive technology. Replicas of significant artifacts, when placed on a screen-covered "shop counter," trigger stories of different immigrant families who had owned businesses in the space during the 19th and 20th centuries. The technology works using RFID tags embedded in the objects and a motion-sensor to capture visitors' "touches" of certain images and text appearing on the screen. This is the only technology that seems to occasionally experience glitches, but it can most likely be fixed by tweaking the sensitivity of the sensors. (Sarah told me that the TM staff was originally concerned that movement on the floors above the basement would trigger the sensors, but luckily this did not turn out to be the case. The content in this section of the exhibit is rich and varied, including images, video, and oral histories. The interactive experience allows visitors to explore on their own, and then the educator in charge of the tour brings all of the separate stories together with footage of an interview with one of the area's contemporary immigrant shopkeepers. I know that seeing the exhibit on my own is not the same as seeing it as part of a group tour, so I'll definitely want to experience it again in a different way, but it was a lot of fun to explore this new addition to the Tenement Museum's great collection of unique experiences. Yesterday evening, the NCPH Consultants' Committee sponsored our second monthly TweetChat using the hashtag #phconchat. 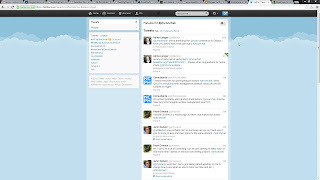 Since last year, the Consultants' Committee has been experimenting with our social media presence using the Twitter handle @NCPHConsultants, and attempting to engage public historians and historical consultants around the world through this medium, as well as through the Consultants' Corner on the History@Work blog. Sounds great, right? Overall, I think we're making some solid progress toward serving our core constituents, but I am continually struck by the necessity of getting our message out in multiple places. To serve a diverse audience, we need to maintain a presence both online and in print. 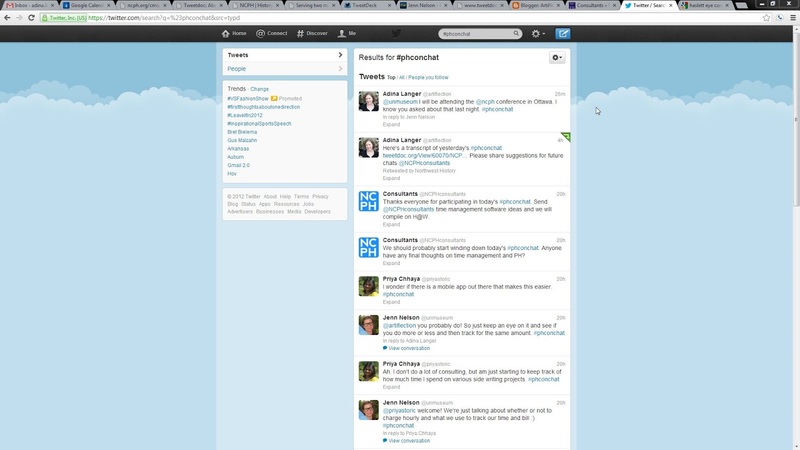 Online, we need to exist on a traditional website, through Twitter, and in the more informal, but engaged, world of the Public History Commons. This begs the question, in what ways is the information environment better with all of these media, and in what ways is it more confusing or overwhelming? Do we risk redundancy, or do we risk tune-out? I suppose that, given enough time, history will tell. After decorating our own modest home for the holidays, my husband and I ventured westward to Grand Ledge on Sunday for the annual holiday traditions home tour. The tour, sponsored by the Grand Ledge Area Historical Society, featured exhibits in the Grand Ledge Opera House and the Museum as well as tours of private homes and business decorated for the season. The day was unseasonably balmy, so it turned out to be a great day for walking around downtown Grand Ledge, in and out of buildings. Highlights of the tour included the 1880s pharmacy, now home to Seven Island Mercantile, and the home of Gina Tamburino, a 1902 Queen Anne built by D.D. Shane, a prominent jeweler, opthamologist, and later mayor of Grand Ledge. Shane's home featured murals of the "seven islands" of Grand Ledge painted on burlap around the upstairs landing. With no single narrative ark, the Grand Ledge historical holiday walking tour gives an impressionistic view of Grand Ledge prosperity, from its days as a resort town and furniture manufacturer, to its present as home to insurance executives and other prominent citizens of central Michigan. The ultimate sense is of a town proud of its age and depth of tradition, firmly rooted in its locality. Check out this article in the Lansing State Journal for more detail. Tonight from 5:00 p.m. to 7:00 p.m. marks the premier of the Historical Society of Greater Lansing's Lansing High School Days exhibit. Come see it at the Creyt's building (831 North Washington Street in Lansing) today or on one of our additional open house days, 12/2, 1/6, 2/3 or 3/3. Today I had the opportunity to attend a workshop sponsored by the Historical Society of Michigan called "Fabricating Professional Exhibits for under $500." I attended wearing my Historical Society of Greater Lansing board trustee hat and hope to incorporate some of the techniques I learned in this workshop into future pop-up and traveling exhibits mounted by the HSGL. Use hollow core doors as mounts for traveling exhibitions and temporary exhibit walls. They're light, cheap, and you can attach things to them easily. Have large graphics printed professionally on adhesive vinyl. Museum wax is a great reusable adhesive! Use vinyl letters for a special touch to jazz up a simple exhibit. Use composite board to make stands for large artifacts. Use pine stanchions to hold exhibit text or barrier ropes. Display multiple digital images with a digital picture frame or a small flat-screen TV. Make everything blend together with a good coat of paint. If you're able to splurge, splurge on a good color laser jet printer, a scroll saw, a mat board cutter, and a dry mount machine. My biggest takeaways from the presentation were, thus: light, cheap, and adhesive, are the way to go! 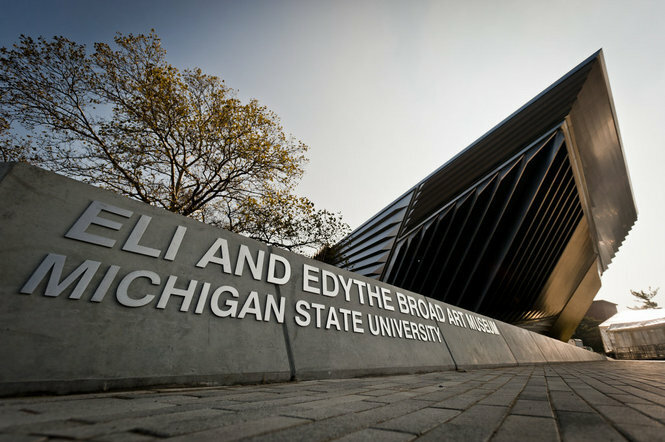 Although I wasn’t able to make it to the grand opening celebration for MSU's new Eli and Edyth Broad Art Museum last weekend (November 10 and 11, 2012), I had a chance to visit yesterday, and I was very impressed! There seemed to be a pretty wide swath of the community visiting at the same time including groups of students who were entranced by the video exhibit on the second floor. It was neat to see how the art worked with the building’s unique architecture (designed by Zaha Hadid). I’ll admit I had been a little bit skeptical, but the angular spaces created within the museum flooded with natural light well into the late afternoon, and they seemed to engage the artwork and the visitors in a thought-provoking dialogue. I noticed a lot of people viewing the galleries from different perspectives, stopping to look at pieces again after seeing them from another side. I also enjoyed the ease with which mobile technology was incorporated into the design of the gallery experience. It was very easy to experience the artworks on multiple levels depending upon how deeply you wanted to engage with the context of the pieces. This also provided a great opportunity to deepen understanding of the relationships between the historical and contemporary pieces on display. So many museums have to add these kinds of layers later, so it must have been ideal to be able to plan for these kinds of interactions from the beginning. The only media critique I might offer involves the sound bleed in the video gallery. I’m not sure how you’d overcome this, but it can be tough to focus on one of the video pieces when loud sounds come through from its neighbors. I'm looking forward to writing more about specific exhibits in the future. In the meantime, visit as soon as you can! In a quiet moment, taking a break from mulling over Superstorm Sandy's devastation, this was sent to me by a curatorial colleague from New York City. As a historian, I'll admit that I often find the art world to be rather mysterious. I'm especially intrigued by the way in which art critics and collectors seem to periodically discover "democracy." When curators exhibit art by "self-taught" artists, they often do so with great fanfare and a sense of astonishment, as if they have truly uncovered the next best thing. In tiny crevices and under dusty beds, there lies a secret creativity by the unknowns of society. Unexpected, delicate, profound, this democratic work has inspired the world’s greatest artists and creative minds. Is this creativity special simply because it is "secret" and needs established art-critics to unearth it and expose it to the dazzling light of fame and recognition? Reading a little bit deeper into the Museum of Everything's endeavor, I know that my gut reaction is over-harsh. The project is doing good work by promoting works by people with disabilities and those who lack privilege or connections. Perhaps what I find so problematic about the tendency of art critics to infuse "subaltern" art with elevated meaning, is that I see the same thing in the discipline of public history. 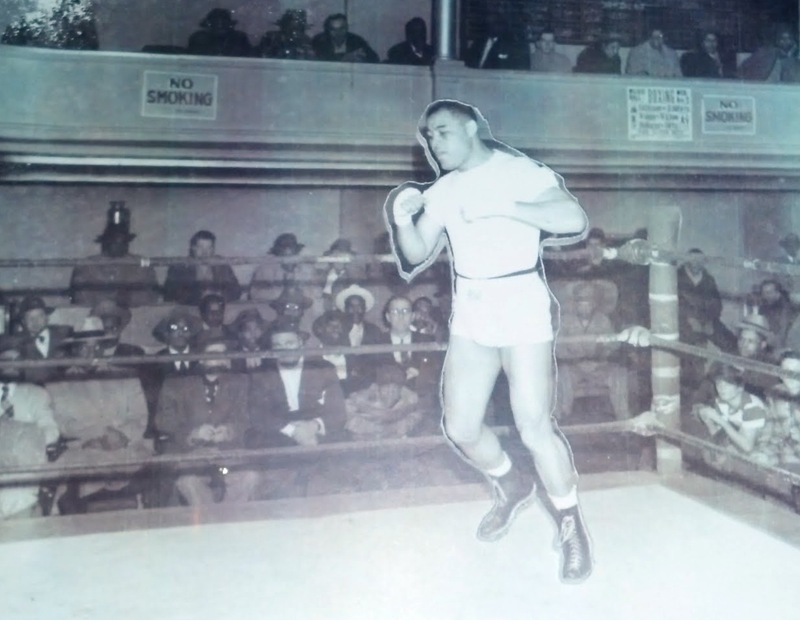 We well-educated public historians have a tendency to get excited about "contextualizing" the stories of "everyday" people within a "larger" historical context. We may find individual stories intriguing, but they are more meaningful in aggregate. That is why true collaboration is challenging. I suppose the key in all of these encounters is to know yourself. If you know what makes you tick and gets you excited, you can recognize when you are telling the stories you want to tell vs. those that your partners may want to tell. Merging your approaches, you can create something new and interesting together. All that being said, the Museum of Everything does some pretty nifty things with their website. My favorite it their "exhibition #4d" which is set up like a true set of galleries for a visitor to explore instead of one long slide-show or a searchable database. This lends a sense of physicality and proximity to the often-restrictive digital environment. The artworks are only tagged with an artist's name and location. No other contextual information is provided, so the experience of viewing them together is contained. Any further exploration will have to be done "outside" the museum. Like other quality gallery and museum experiences, this one leaves me wanting more, inspiring me to go do my own digging. 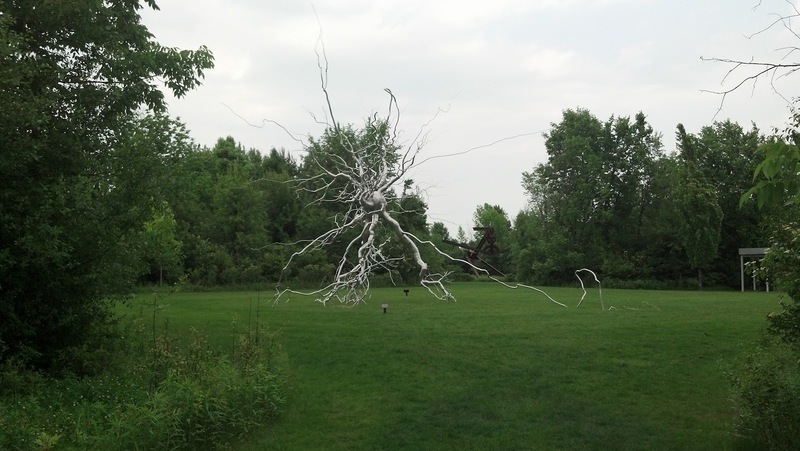 For more about the project and its place within (or without) the art world, see this article. On September 2, Sam Roberts of the New York Times posted a wonderful piece called "The History of New York in 50 Objects." 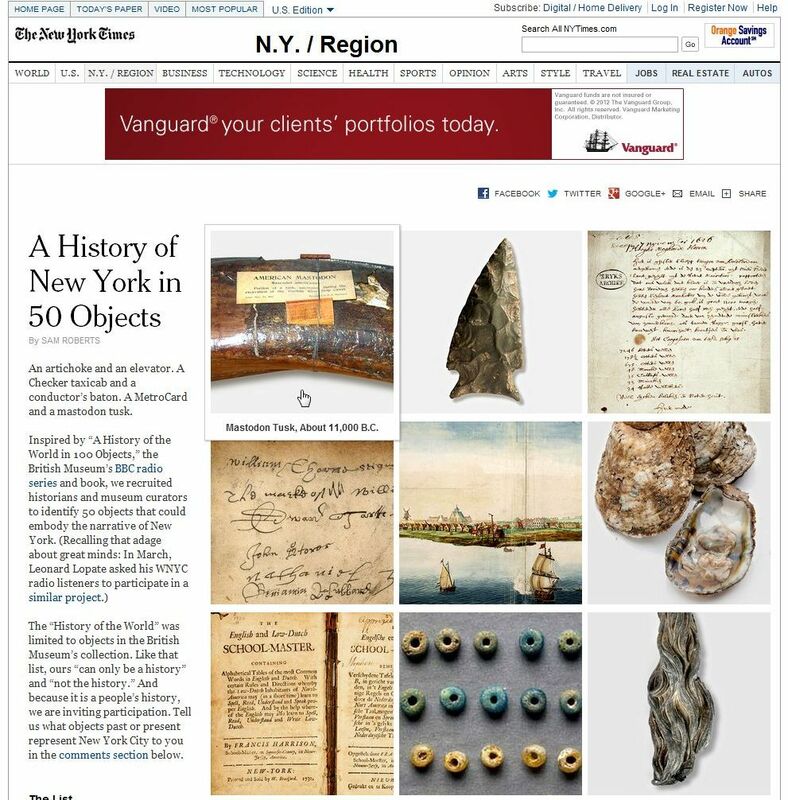 The objects were selected by local historians and museum curators and represent a wealth of archival documents, ephemera, and material culture. The essays that accompany the stellar color images of the objects are meaty yet succinct, occasionally snarky, but always sophisticated. Take a look and imagine what you might add! 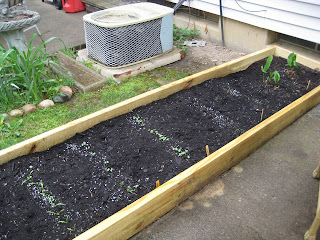 As newbie gardeners, my husband and I seek role-models wherever we can. Living in Michigan, where the growing season is short, it's extra-important to learn how plants grown close to home. 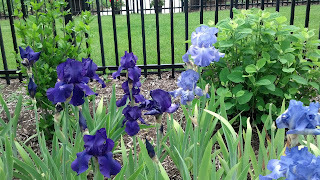 Luckily, MSU provides a wonderful public resource in the form of the W. J. Beal Botanical Garden located adjacent to the main library building on campus. 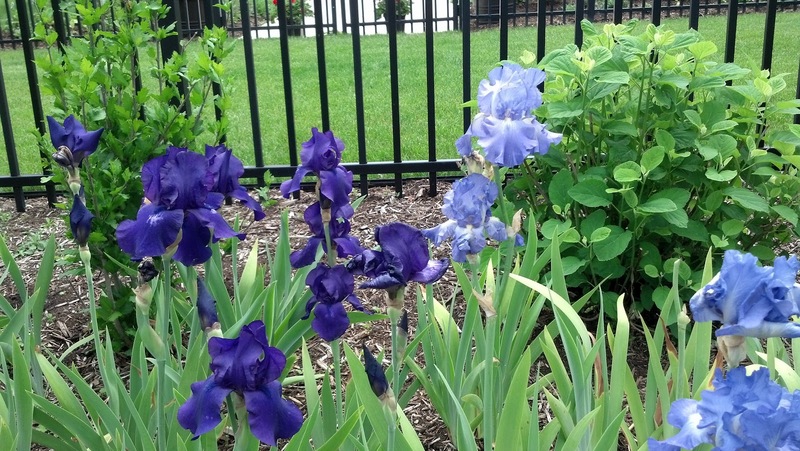 According to the garden's website (informative, but not intuitively designed), the garden has been in existence since 1873, less than 20 years after the university's founding. It was a labor of love for the botany professor for whom it was named and has earned the distinction of being the oldest continually operated botanical garden of its kind in the U.S. Inspired by Charles Darwin's writings (and a personal letter from the internationally renowned scientist), Beal successfully hybridized corn in 1877, increasing yields by "53%." In that way, Beal arguably changed the international agricultural landscape forever. Superlatives aside, the garden is comprehensive in its sampling of local and internationally significant plants and is lovingly tended by staff and volunteers. It serves as an example of "scientific public history," creating a landscape that links the past and future of the university. And it's a great place to spend a summer morning. Upon entering the Patterns of Inquiry exhibit, on view at the MSU Museum now through September 23, 2012, you are faced with a choice. If you head to your left, you can learn about the history of quilts as a means of expression. If you go to your right, you can learn about quilts as artifacts, objects with a physical history and connection to a distinctive provenance. Both directions lure you with colorful offerings and seemingly traditional patterned squares. But on closer examination, the featured quilt on the left is not at all ordinary. 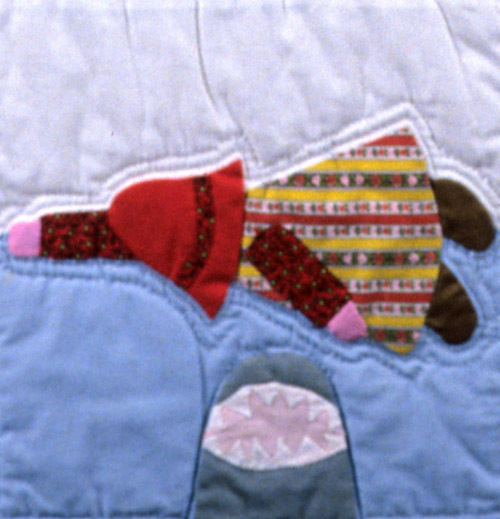 "The Sun Sets on Sunbonnet Sue" is a tongue-in-cheek expression of a feminist ideology, literally turning the traditional domestic pattern of "Sunbonnet Sue" on her head (or casting her out into space, or feeding her to a shark, depending upon which square you look at first). This surprising take on what might appear to be a tame medium sets the standard for the rest of the exhibition which focuses on the myriad ways in which people can learn from, and with, quilts. I've never been to an exhibit quite like this one before. Most museum exhibits focus on a single historical narrative or on artifacts as art objects, telling aesthetic stories contextualized only by the who, where and when of their creators. Patterns of Inquiry is more about how we look at quilts than the quilts themselves. The exhibit draws on the MSU Museum's broad and deep collection of quilts ranging from the 19th century to the present. 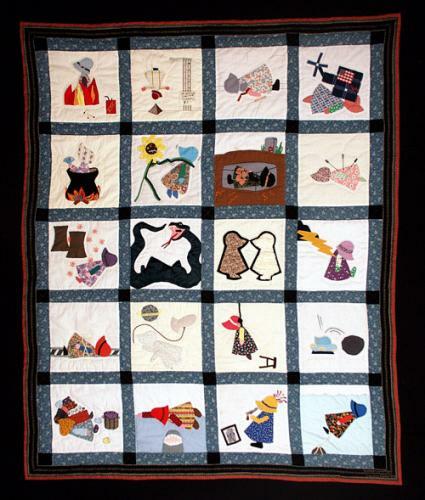 It is further bolstered by the digital collections of the Quilt Index, a joint venture with the University's MATRIX Center for Humane Arts, Letters, and Social Sciences Online. According to the exhibit's curator, Mary Worrall, "A goal was to highlight the interdisciplinary and partnership work we have been doing with quilts. It was very difficult to make the final selection on what quilts to include." With such a diverse array of quilts to choose from, I can definitely see how this was the case. The quilts that made the cut, though, do a great job of illustrating their respective roles in research and education. A gorgeous 19th century crazy quilt made by a father-daughter team shows off a new initiative to use visual recognition computer software to classify patterns in large collections of quilts. A quilt with a pattern of tessellations demonstrates the potential for using quilts to teach math, while a neighboring quilt with a more figurative pattern showcases ways in which quilts can be used to study history. 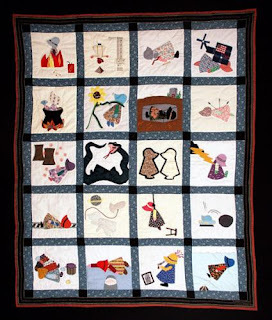 A selection of quilts relating to people with Alzheimer's illustrates the way in which quilts have been used to promote awareness about public health issues while it individualizes the experiences of those most directly affected. While Philadelphia places its colonial history front-and-center, and New York more-often-than-not embraces a spirit of change, sometimes grinding its historical markers into the pavement, northern Michigan seems to take an unusually high degree of pride in its long history as a tourist destination. On my most recent trip up north, I became aware of this acutely when I stepped onto Munising's bay-side dock and encountered a historical marker celebrating the history of "Pictured Rocks Cruises." The act of placing the marker beside the queuing place for contemporary cruises embraced and legitimized my presence as a tourist as a part of the region's economic heritage. In critical analysis, most notably and recently put forward by my colleague, Cathy Stanton, author of The Lowell Experiment, public historians can be seen as actively facilitating changes in the labor culture of a place from the production of tangible goods to the production of services and ideas. Often, the critical questions that public historians would raise are, at least in the case of Lowell, "sequestered or enclaved so that...insights are not permitted to unsettle the positive image of the city's overall redevelopment project." But what about a city, or a region, that has relied on tourism for decades, or even centuries? Under those circumstances, what does the fronting of the history of tourism mean for those engaged in tourism today? As a sometimes self-critical tourist, it is easy to feel comforted by these overtures of acceptance. This tourism history becomes the "heritage" of the region, inviting you, the visitor, to become a link in a long chain of (to use another buzz-word) regional sustainability. You are not a scavenger, flooding to a place that has lost its industrial identity and replaced it with voyeurism, you are a fellow-traveler on a long road of appreciation for natural beauty and a spirit of hospitality. On Mackinac Island, it is easy to feel like a re-enactor simply by crossing the straits. The citizens of Mackinac Island, supported by their burgeoning tourism industry, created their own alternative historical trajectory by banning the automobile on the island in 1896. 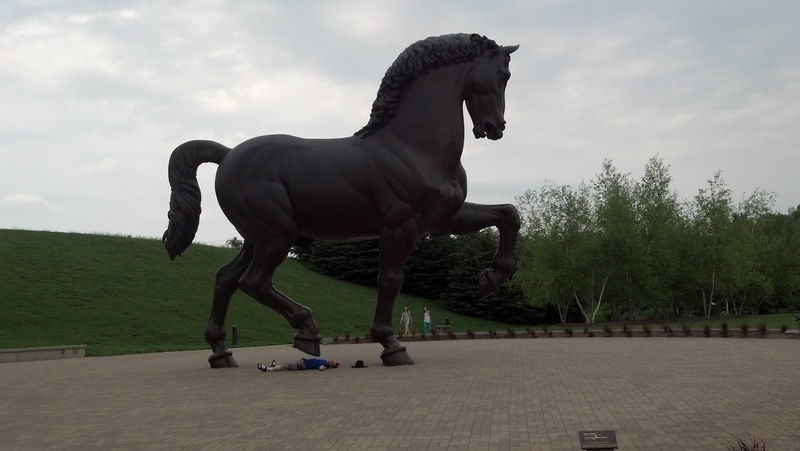 As a result, horses abound every summer, and a carriage tour business thrives. A bastion of the Mackinac Island tourist scene is the Grand Hotel which has been in continuous operation since 1887. The hotel boasts the longest porch in American (and probably the world) and a self-consciously old fashioned sense of hospitality and resort culture that includes evening dress-codes that call upon vacationers to wear coats and ties or dresses after 6:00 pm every evening. Inside the hotel, the walls of the basement level are decked with hundreds of original historical documents, from lease-letters to newspaper articles, old photographs and old menus. These artifacts are posted in no particular order, and are rendered somehow even more inviting as a result. This is a kind of family album collage provided by a hotel with the kind of soul created by years of continued use. For a more orderly portrayal of the history of the Grand Hotel, a visitor need walk only a few blocks to the Mackinac Island Art Museum where the special exhibition currently on display features artifacts and enlarged images from the same abundant collection on display within the hotel itself. I found myself particularly drawn to the menus and brochures from every era of the hotel's existence. I found myself comparing the 19th century menus favorably with the contemporary menus focused on local Michigan products and fresh produce and, with a "presentist" self righteousness, turning my nose up at the gelatinous dainties offered in the 1960s. The current issue of the Public Historian offers some great insights into "Food in Public History" both cautioning interpreters to focus on the cultural perceptions of the past and encouraging folks to help others connect with the "food ghosts" of a particular place. I would argue that Mackinac Island offers food ghosts as well as transportation ghosts and image ghosts. Perhaps in this one place there is more continuity than change. To start, I have to rave about the organizational acumen of the Mackinac State Historic Parks. The Parks Commission is faced with no small task. It is in charge of two major historic forts, five historical buildings on Mackinac Island, an art museum, a lighthouse, a "discovery park" and the trails and natural features of Mackinac Island State Park. Together, these sites encompass almost three centuries of regional history and a century and a half of administrative history. From its website to its admissions procedures, the Mackinac State Historic Parks are a model of public engagement, commitment to research, and preservation best practices. Although this past week marked my second trip to Mackinac Island, it was my first time visiting more than just Fort Mackinac and the Mackinac Island State Park. Having driven south from Munising on Michigan's Upper Penninsula, my family and I decided to stop at the Visitors' Center under the Mackinac Bridge to learn about visiting Colonial Michilimackinac, about which we knew little. We were drawn in by the value of the triple choice combination ticket which granted us admission to both historic forts, the Mackinac Island Art Museum and the assorted buildings of historic downtown Mackinac Island for the normal price of admission to just two of the sites. Although my past experiences at Fort Mackinac were overwhelmingly positive, I found myself pleasantly surprised by the marriage of professionalism and accessibility that pervaded all of the sites we visited (we did not get to the Light House or the Discovery Park during this trip). All of the Parks' historic sites are marked by a commitment to living history style interpretation. For the sake of coherence, this necessitates an overall association with a particular time period (although museum exhibits tucked away in various corners can stretch the interpretive chronology). Colonial Michilimackinac is set in the 1760s, during British occupation and the height of the beaver fur trade which employed Chippewa and Ottawa tribesmen and French voyageurs and hivernants. The interpretive staff were incredibly friendly and informative, navigating the delicate balance between portraying a particular character and relating to the experiences of contemporary visitors. The physical architecture of the fort is mostly reproduction, but reproductions are backed by an astonishingly comprehensive archeological program in partnership with Michigan State University and ongoing since the 1950s. The website boasts rich online exhibits about the archeological programs within the parks, and a subterranean exhibit beneath one of the traders' homes within the Michilimackinac fort showcases real excavated artifacts within multiple contexts. Most artifacts accessible to the public are reproductions, enabling the paradoxically authentic experience of interacting with objects from the past. On Mackinac Island, highlights of historical interpretation include early 19th century cooking demonstrations at the Biddle House and multi-media medical history exhibits at Fort Mackinac in addition to a band of merry, roving 1880s American soldiers who were responsible for the fort when it was briefly part of America's second national park. It's heartening to see such a healthy, thriving example of state-level historical interpretation. During my last trip to New York City, I took an evening to indulge my interest in the intersection between physicality, functionality and aesthetics but going to the Museum of Art and Design (MAD) with a close friend. Neither of us had been to the museum since it opened up its relatively new space at 2 Columbus Circle in 2008. But every Thursday night, MAD opens its doors until 9:00 pm and invites visitors to "pay what they wish." It was the perfect opportunity for us to explore. We were duly impressed. 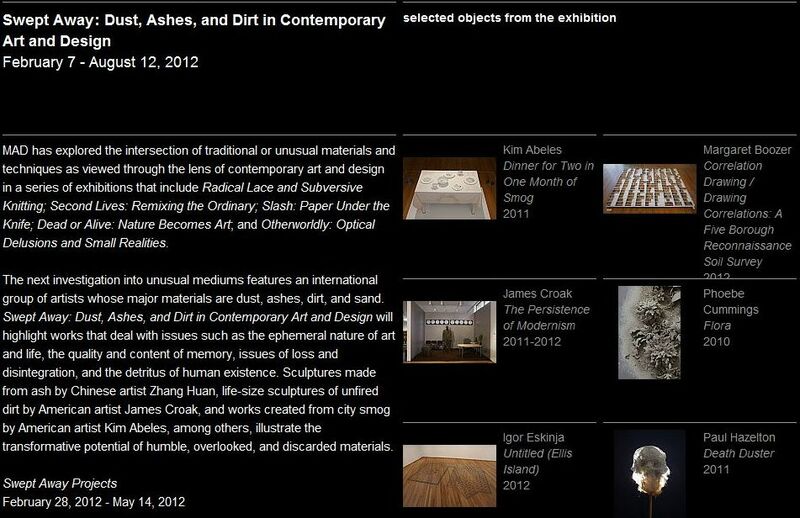 MAD's featured exhibit that evening was called "Swept Away" and remains on view through August 12 2012. The exhibit follows in the museum's tradition of presenting international perspectives from emerging artists and designers using unusual media. 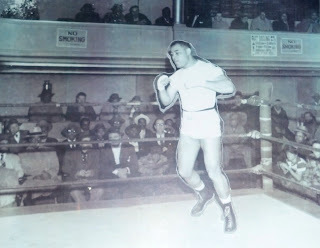 In this particular case, the media were particularly ephemeral: dust, smoke, dirt, and sand. My work for the 9/11 Memorial Museum project has strengthened my interest in dust as a component of art and artifacts, lending them physical gravity as evidence of a particular human event. 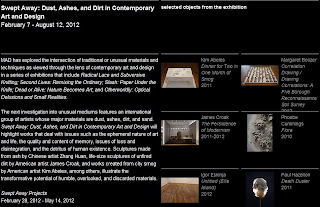 The 9/11 Memorial's artist registry includes works from artists who incorporated dust from Ground Zero and lower Manhattan into their personal artistic response. Works by Jourdan Arpelle and Ejay Weiss provide notable examples. In "Swept Away," artists' and designers' approaches to the media vary widely. Their works run the interpretive gamut as well, from subtly political statements about the destructive nature of war or the pervasiveness of environmental pollution to placid musings about the workings of nature. One of my favorite pieces used smoke as a kind of paint to produce images on the inside of glass bottles. Another preserved the ashes from a set of the artist's favorite books in unique vials of hand-blown glass. When I read a feature in Slate magazine by Michael Agresta about the future of physical books, this particular piece came to mind again. The feature is called, "What Will Become of the Paper Book?" and posits that books will only be produced physically when their medium lends additional meaning to the book's text. Perhaps in the future, someone will manage to produce artwork from discarded pixels. Undoubtedly, the artistic and historical conversation about form and meaning will remain lively for years to come. What "Good History" Milwaukee has to offer was certainly augmented by the influx of hundreds of historians who attended the 2012 joint conference of the National Council on Public History and the Organization of American Historians this past weekend, April 18-22. I for one was quite intoxicated by the intellectual and social environment of the conference and the city that hosted it. I invite you to read more on the Public History Commons, and I may have more to say about specific sessions once I've had a chance to let my impressions synthesize, but for now, I'd like to share some comparative observations of the Milwaukee Public Museum and the little Redpath Museum in Montreal, visited within days of each other. After a minor scheduling hitch that involved a rapid walk through a blustery Milwaukee afternoon, I made it to a special behind-the-scenes tour of the Milwaukee Public Museum, a large institution dedicated to comprehensive natural history and ethnographic coverage on a world-scale. 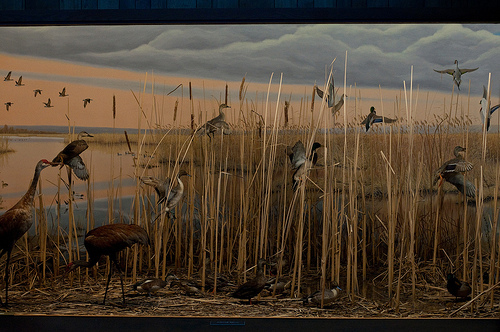 From our enthusiastic guides, the museum's chief registrar and an exhibition curator in charge of the museum studies certificate program at U-W Milwaukee, I learned about the institution's signature "Milwaukee Style" dioramas, the intellectual offspring of Carl Akeley. 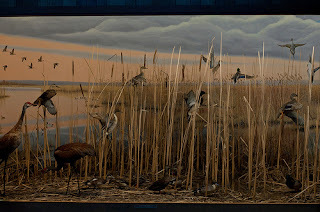 As a former New-Yorker, I had fallen into a common provincial trap, believing that the three-dimensional "still lifes" with taxidermy, natural fibers, and perspective backgrounds had originated at Manhattan's own "indoor zoo," the American Museum of Natural History. In fact, Carl Akeley first realized his artistic vision of a style of taxidermy where animals were placed in realistic positions, surrounded by their natural habitat, at the Milwaukee Public Museum. He later went on to propagate the style at the Field Museum in Chicago and then at the American Museum of Natural History where he worked from 1909 until his death in 1926. At the Milwaukee Public Museum, Akeley's style extends to the cultural displays that offer visitors an Epcot-style world tour from the Americas to Africa and Asia. Even Europe is represented, albeit in a more modern context beside an exhibit meant to transport visitors back in time to "The Streets of Old Milwaukee." Although I was impressed by the attention to detail, color, and loving maintenance in all of the Museum's exhibits, I couldn't help but feel slightly uneasy amidst the juxtapositions of disparate times and places. Crafted like stage-sets, the museum's exhibits have a kind of spacial narrative without explicit transitions. As a part of the special behind-the-scenes tour, I had the opportunity to learn about the components of the exhibits built in the late 19th century, augmented by the WPA in the 1930s and then installed in the museum's permanent home in the 1960s. However, none of these chronological mash-ups are illuminated in the museum's exhibit captions. I know I'm not alone in my desire for this kind of meta-text, especially in narrative museum exhibits (a kind of historiography), but this is rarely granted to the visitor, even in contemporary credit panels which more frequently credit donors than curators. I find that I am less bothered by a lack of chronological grounding in the non-linear, more old fashioned "cabinet of curiosities" style of exhibitry. At the Public Museum, this style is proudly showcased in the Sense of Wonder exhibit on the Museum's first floor. As I discussed in a previous post, the Redpath Museum on the campus of McGill University, also showcases the turn-of-the-20th-century style of exhibitry throughout its gorgeous 1882 building. Interestingly, both the Milwaukee Public Museum and the Redpath resist alteration due to strong architectural imperatives. I am left pondering the value of versatility and flexibility in a museum. Does a museum that is frozen within its own historical context become an artifact on display? Should institutions embrace this state of affairs when faced with physical plants resistant to change? Does the virtual world then become the best avenue for expansion and contemporary curation for institutions such as these? If an old exhibition is truly a gem, then this doesn't seem like too bad a turn of affairs. Rebecca Skloot's Immortal Life of Henrietta Lacks should be required reading for aspiring public historians and medical ethicists alike. It weaves together the story of scientific discovery, the history of American race relations and socioeconomic inequality, and a profile of a colorful family whose members' unique voices lend human authenticity to a larger enterprise. But aside from doing all of these things so well, the story raises questions about ownership, innovation, and capitalism that resonate across a myriad of contemporary debates. One of the biggest debates revolves around ownership of personal data. When we post personal data to the internet, do host companies, providing us with that posting service, have the right to share or sell that data? There are movements afoot, such as this one in the EU, to provide users with more control over their personal data, along with the "right to be forgotten." Some would take ownership a step further, giving users the right to sell their data to companies in exchange for money or favors. The world works best when everyone is allowed to be as creative as possible and to live comfortably off the fruits of their labor. That doesn't mean that people should be able to steak out bridges, like trolls, and collect tolls every time someone happens upon the thing they've claimed. The more complex our society becomes, the more important I believe concepts such as "open source" and systems like Creative Commons licenses become. I hope their influence can spread broadly to protect a world where the lines between the "real" and the "intangible" grow thinner and more pixelated every day. Like many Americans, I enjoy watching the Super Bowl not just for the excitement of the big game, but also to see what our highest-paid advertisers cook up to sway this now-rare mass audience. This year, I was struck by the prevalence of commercials that used the grand sweep of history to evoke a sense of continuity and pride. The pride part was particularly fascinating because the commercials' focus was not on American prosperity but on the nation's ability to weather the Great Depression. Deep within the Great Recession, I suppose that advertisers are hoping that reminding Americans that they've gotten through even worse times in the past will boost their confidence and make them want to buy (cars and beer mostly). But Chrysler's "Halftime in America" ad seemed to draw the most from the notion of America's historical ability to overcome bad times without explicitly evoking the past (except Detroit's recent past). I wouldn't be surprised if they also intended to draw parallel's with Reagan's "Morning in America" ad, yet another subtle continuity. These commercials emphasize persuasive strength of drawing historical parallels, whether or not they are factually accurate. Resonance is a powerful tool. Last month, I accompanied my husband to Chicago, where he attended a conference, and I caught up on some much-needed sight-seeing. After a visit to the impressive but confusingly-organized Art Institute of Chicago (highlights included the Marc Chagall America Windows and the Thorne Miniature Rooms), I walked with my friends along the Miracle Mile, taking in some intriguing and peculiar sights. In the peculiar category, the Tribune Tower ranks at the top of my list. Completed in 1925, this Neo-Gothic sky-scraper is studded with pieces of famous places brought back to Chicago by Tribune correspondents at the request of the newspaper's owner, Robert "Colonel" McCormick. Perhaps the incorporation of these antiquities (ranging from the Taj Mahal to Notre Dame de Paris) satisfied Colonel McCormick's hunger for international significance, but it is, by far, the most concrete manifestation of a world-ranging ideology I've seen outside the British Museum. which specializes in Chicago-themed photography exhibits. In early January, the exhibit featured photos from the city's archives offering stark "then and now" comparisons for landmarks around the city, ranging from famous places to the now-relatively-obscure sights of important events from the past, such as the infamous Haymarket Affair. Although the event is commemorated with a monument in Forest Home Cemetary, and the site of the confrontation between police and protestors is marked with a steel sculpture, the area is not widely traversed by tourists and might otherwise be missed. The City Gallery is free and inviting, and in my opinion, beats window shopping at all but the most impressive departments stores on the Magnificent Mile. Over the week between Christmas and New Years this year, I traveled to Colonial Williamsburg with my family. While there, I attended a concert of chamber music at the governor's palace meant to emulate the kinds of music that the state's upper-crust would have enjoyed in the years immediately preceding the American Revolution. My lack of intense enjoyment of this musical style prompted some interesting conversations with friends who had benefited from Oberlin Conservatory's phenomenal musical education. My friend, Kate, provided an insightful view, introducing me to the scholarship of Bruce Haynes, a "period performer" who wrote a historical treatise called The End of Early Music in which he explained that there is a lot more to the musical performance than the music itself. Historical performance requires a delicate dance, bringing together the peculiarities of instrument, venue, audience and aspiration to "authenticity." Haynes' view reminds me of David Lowenthal, a historian who wrote a book called The Past is a Foreign Country. Excerpts of his book are usually required reading in public history classes, but his main argument is that you can't easily understand the culture of the past, or take tiny parts of that past culture into the present (like music, or art, or furniture or architecture) with only assumptions drawn from your present context. To better understand any culture from the past, you have try to reconstruct its context by understanding what came before and after it, and what kind of people were into it when it was going on-- what their goals and motivations were, etc. But any attempt at historical performance or re-enactment makes things even more complicated because if you perform or re-enact in exactly the way something was done in the past, it might not make any sense to a present audience. You need some kind of transitional interpretation to aid in any current audience's appreciation. So, going back to the chamber concert I went to at Williamsburg, I wonder whether they accomplished this appropriately. I imagine that a lot of the chamber music we heard at the candlelight concert at the governor's palace would probably have been heard in a more "party" context back in the 18th century. A lot of people probably would have been milling around and talking through the music. At the same time, those people attending a party at the governor's palace probably did so for rather formal reasons, so even some action that appeared casual probably had a great deal of contrivance behind it, making the measured, formal quality of the music even more appropriate, whether or not they were actually involved in the sarabande or gavotte. Our 21st century audience was mostly made up of middle-class or upper-middle-class tourists who were treating themselves to an extra evening activity, a measured act of liesure representing their aspirations to a higher level of cultural refinement, or to personal identification with being well-educated, or worldly in a history-geek kind of way. So, I doubt that there was any political maneuvering going on during our evening concert-- Instead, I think that every little tourist group was trying to have a very personal experience in the midst of a crowd of strangers. So, i doubt that there could be a way to more "authentically" recreate the experience of 18th century chamber music for the crowd that vacationed at Colonial Williamsburg without detracting from the enjoyment of the visitors.. That being said, I think I still would have enjoyed more instruction about the role of the composers they chose to perform-- would they have been well-known or new to the people attending a contemporary concert? I guess most of the time, I don't mind a little additional instruction. Along those lines, one of my favorite programs we attended in Williamsburg was a performance of single acts from contemporary plays called "Rogues, Villains, and Fops." Before the actors came on to perform each scene, they gave a pithy introduction to their character and what an 18th century audience would have expected. My favorite was the fop-- a character who used displays of fashion-consciousness bordering on feminity ostensibly to attract women. Is there a modern equivalent? I feel like boy bands fit the bill in the 90s and early 00s, but what now? Would love your thoughts.